This document was issued in New Bedford to the schooner D N Richard, which was under the command of Isaac P. Webb, with a carrying capacity of only 92 tons. The vessel was heading from New Bedford bound for the Atlantic Ocean, with provisions and stores with utensils for a whaling voyage. This was the last voyage for this small whaler. She left New Bedford on December 3, 1868, the day her sea letter was issued and never returned to her homeport of New Bedford. In other ships, she sent home 92 barrels of sperm whale oil and 104 barrels of right whale oil. She later put into Norfolk, Virginia disabled. She was withdrawn from service in 1870. The sea letter is in four languages: French; Spanish; English; and Dutch, and is signed by President Andrew Johnson who served out almost the full second term of Abraham Lincoln after his assassination in April 15, 1865. He was a southerner who served in the U.S. House of Representative and then Senate where he remained when his home state of Tennessee seceded. When he ascended to the Presidency, he faced fierce opposition to his ideas from the Radical Republicans and was no match for their power during the Reconstruction of the South. 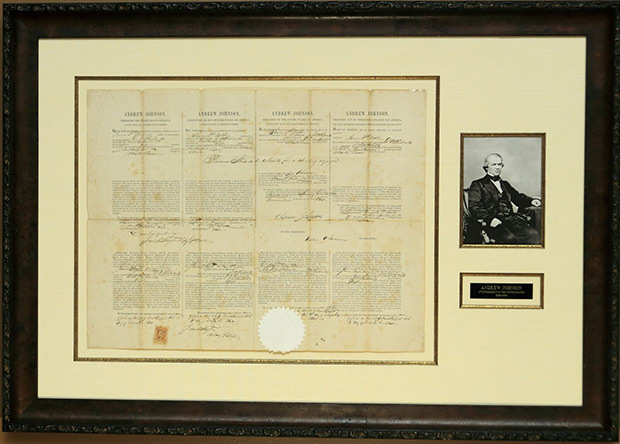 The document was also signed by Secretary of State William H. Seward, who continued in the position to which he had been appointed by Lincoln. After the end of the Civil War, Seward continued to expand U. S. territory and is best remembered for “Seward’s Folly”, the 1867 Alaska Purchase for $7.2 million. James Taylor, notary of New Bedford, also signed as both Collector of Customs and notary. The actual Collector at the time was Lawrence Grinnell. This sea letter is printed on rag paper and bears the Great Seal of the United States at the center bottom and the embossed seal of the Collector of customs on the center left and the notary on the bottom left.